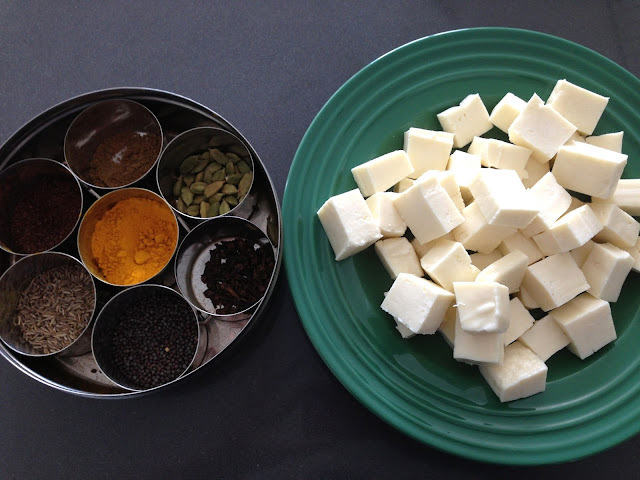 We've had some paneer waiting in the fridge for me to make Kadhai Paneer. But, as often happens, life got in the way, bell peppers didn't, and no Kadhai Paneer was made. 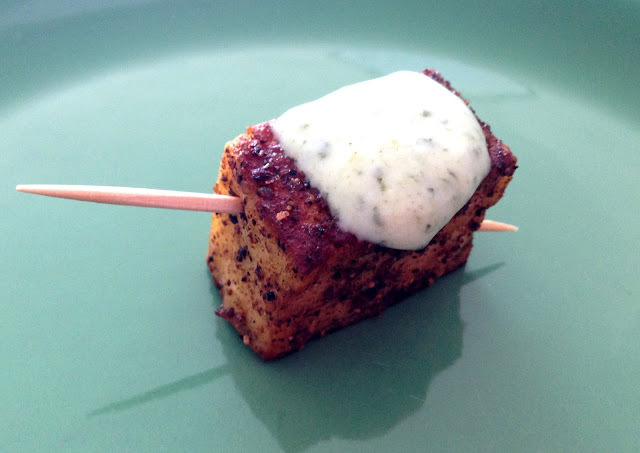 Instead, some quick and easy paneer kebabs with a cooling mint yogurt sauce at the side made a delicious snack! Mm mm this unassuming cheese just does wonders with whatever you throw at it. This recipe doesn't take much more than 10-15 minutes, and is perfect for a quick evening appetizer (or, if you're like me and don't mind eating plain ol' cheese for lunch - or dinner - or breakfast...). 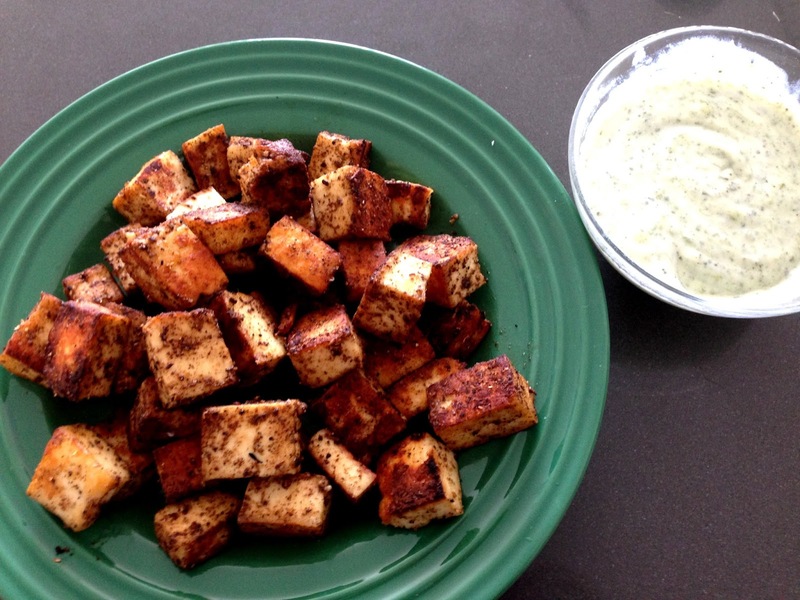 Cut the paneer into 1 inch cubes. Paneer is actually super easy to make at home - but obvi, if you're starting from scratch this wouldn't be a 10 minute recipe! The next time I make my own paneer I'll post it up here, but for now I just used Nanak paneer. Heat the oil on high. 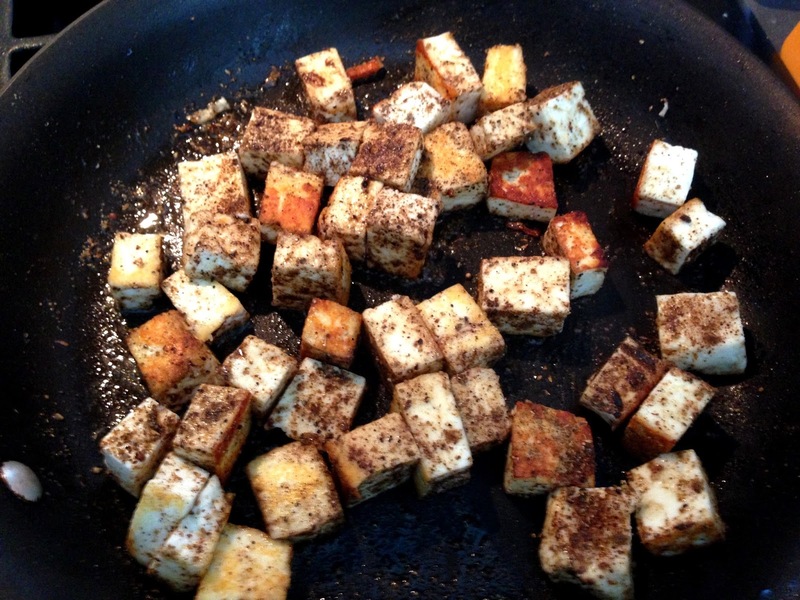 When it starts leaving the sides of the pan, add the paneer. Don't stir it around too much immediately - let it hang out for a bit and get nice and brown. Sprinkle with the spices, salt, and pepper, then stir around until all the sides are nicely browned. If you think the pan is getting too hot and the paneer is starting to burn, lower the heat to medium - you want the paneer to be cooked through and crispy on all sides without getting too dark. And done - Paneer Kebabs are ready (kebobs? kabobs? kababs?)! Mix up the yogurt dip ingredients and serve on the side. They're also great on skewers or toothpicks for an easy party finger food! Wow! Looks great! I also love your pictures of all the steps in the recipe! Thank you! This was a really simple recipe, but especially for recipes with a lot of steps I think it helps to see what things are supposed to look like at various stages!